Honestly, I am not sure this should really be considered a BLT. I mean I swapped the lettuce for arugula, added melty smoked gouda cheese and some mashed up avocado… because it just works and it needs to be there. Avocado needs to be in, and or on, everything, in my opinion. Alright, I take that back. Not everything. Definitely not in cereal and definitely not on my chocolate cake, although I would not be opposed to adding pureed avocado into my chocolate, cake batter that is. Come on? You know I would. Oh and FYI, gouda cheese, bacon and corn? So good. Just so stickin good guys. These are so good that I have not stopped thinking about them all weekend. They are kind of like a fancy pants, grown up BLT. Normally, I want nothing to do with fancy, or grown up for that matter, but for these it works. Or you could look at it the other way around and say that I basically just trashed up a BLT. Either way, it’s still good. Speaking of grown up, let’s talk about age. I am young, nineteen if you did not already know. Most the time I act like a thirty year old, but here is the weird thing. In my brain I still feel like I am that twelve-year old girl who loved riding dirt bikes with her brothers, having her dad teach her to drive stick shift, shopping like no tomorrow with her grandma, playing baseball in the back yard and hating Sundays because that meant Monday was the next day – which meant school, which I very much disliked (to put it nicely). Oh and by the way, I still love driving stick shift cars. It is kind of my thing and I have always been good at. Maybe because I knew how drive dirt bikes since I was like nine, but I just have fun doing it. Anyway, I still look like I am twelve. Ok, maybe not twelve. Maybe more like sixteen (but my brothers would say twelve), but definitely not nineteen. Blame it all on the genes. No really, it is in my genes. My mom’s wedding photo is actually kind of creepy because she honestly looks maybe thirteen or fourteen. Sometimes I feel like a grown up, a real adult with responsibilities, stresses and problems and way too many worries. But then there are those rare times when I am hanging with my brothers. Those are times I feel more my age, more immature, more kid-like. This is the grown up, sophisticated BLT. 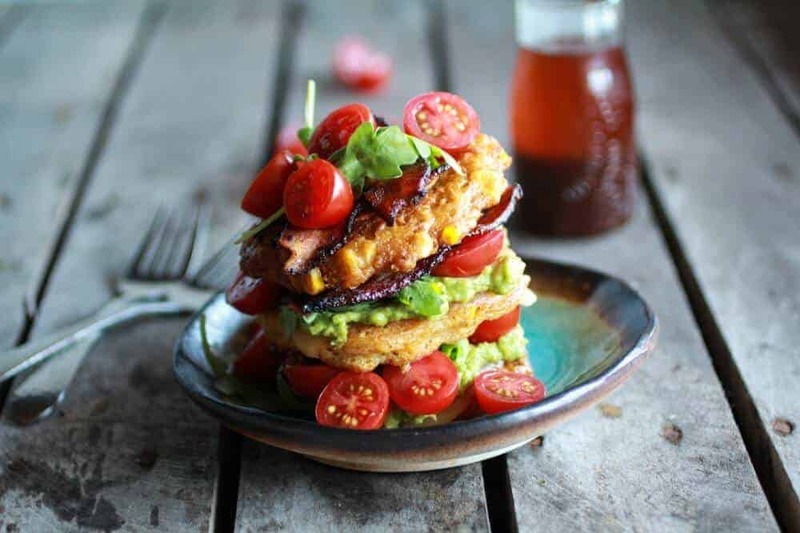 Cause I mean really, this BLT grew up, blossomed into a beautiful looking stack, and became SO delicious. Oh and then there is the bourbon in the dressing thing. Or maybe not, since I had to have my mom go and buy me the bourbon. Nah! I don’t drink. Like at all (no reason other than it is just not something I am interested in), but you all know how much I love eating with it! Like really, really love eating with it. Is that weird? Whatever, it’s pretty obvious I am an odd one. But I am totally A Okay with that. Oh and the corn fritters? Yeah remember when I made these a few months ago? You know with coconut whipped cream and sweet honey BOURBON (oh man, I have too many bourbon recipes) syrup. While, I just had to make them again. Really, I had to. They are so good, and combined with the bacon and the tomatoes and the gouda cheese and the chipotle bourbon dressing? Oh man, it’s like summer food awesomeness all on one plate. Oh fudge, and obviously the avocados too! Honestly, I am not sure this should really be considered a BLT. I mean I swapped the lettuce for arugula, added melty smoked gouda cheese and some mashed up avocado... because it just works and it needs to be there. To make the chipotle bourbon dressing. In a small saucepan over medium heat, bring bourbon to a boil. Cook until liquid is reduced to about 2 tablespoons, 3 to 4 minutes. Transfer to a bowl and refrigerate until well chilled. Once chilled add the olive oil, vinegar, honey, chipotle pepper and garlic. Season with salt and pepper and whisk to combine. Set aside. Line a baking sheet with foil. Arrange bacon strips about 1 1/2 inches apart. In a small bowl stir together brown sugar and cayenne pepper. Sprinkle the mixture evenly over bacon. Bake 14 to 16 minutes until bacon is browned and crisp. Transfer to paper towel; cool. Halve slices. While the bacon cooks make the corn fritters. Add the flour, brown sugar, sugar, baking powder, salt, pepper and 3/4 cup of the corn to a food processor. Pulse until blended together, then transfer mixture to a mixing bowl. Stir in remaining corn and milk, mixing until a batter forms. It should be the consistency of a thick pancake batter. When the oil is hot add a little less than 1/4 cup of batter to the skillet and then quickly smooth the batter out to a circle. Cook for 2 to 3 minutes, flip and place one slice of gouda cheese right on top of the fritters (leave 4 fritters with no cheese). Cook another 2 minutes or until brown and crisped all over. Remove and repeat with the remaining batter until all the batter has been used. Keep the fritters warm. To assemble, place four fritters with cheese on 4 plates. 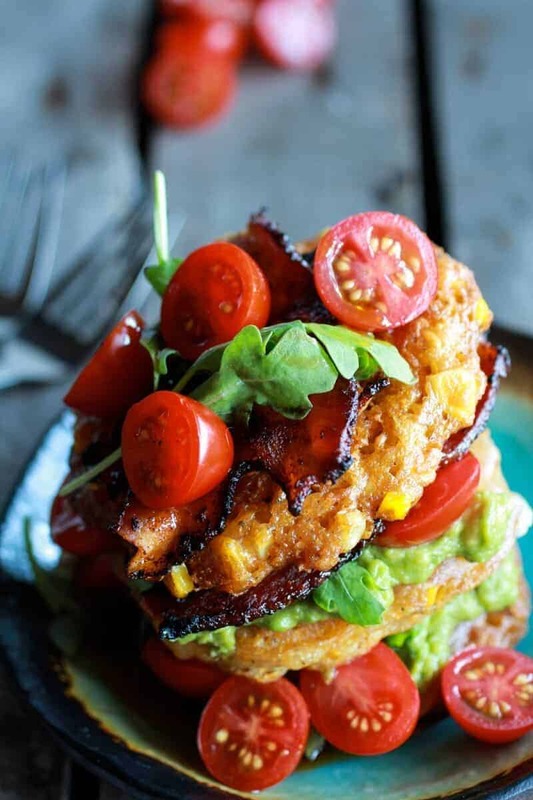 Spread with mashed avocado, arugula, tomatoes and a few slices of bacon. Top with another cheesy corn fitter and repeat the layering. Finally add the non-cheesy fritter (should be the 3rd fritter, 3rd layer) and top with a few arugula leaves, tomatoes and bacon. Drizzle with the chipotle bourbon dressing. 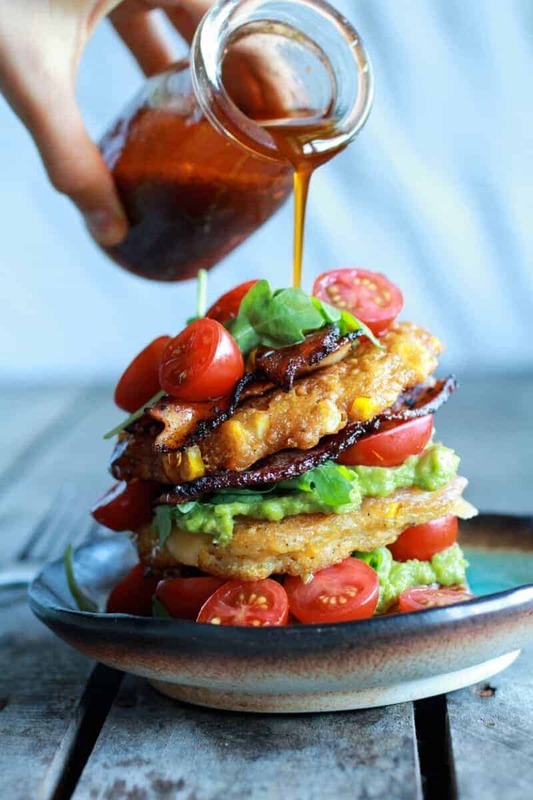 The stacks are really pretty, but if you want these to be an easy eat then just leave the fritters unstacked. If you do this though, I would make a little extra bacon and add another avocado. 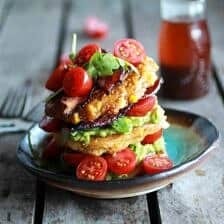 Unstacked fritters leave more room for toppings! Tomorrow I am breaking out the kid in me. Get excited, very, very excited! 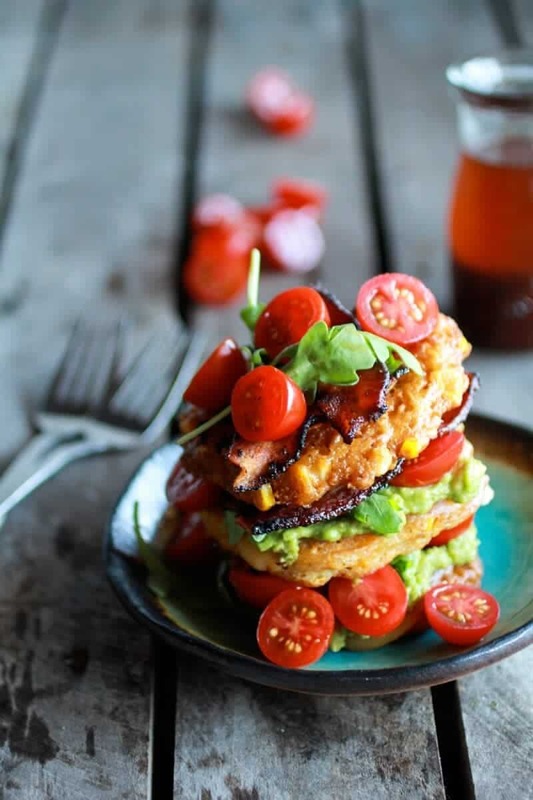 This “grown up, fancy pants” BLT looks so amazing! And I don’t even like BLT (yes, I know thats totally wierd!) 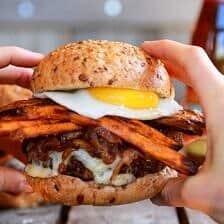 You know that feeling in the back of your mouth, when you see and smell something totally delicious – the pinch as your taste buds activate – well, thats what these pictures are doing! Now I want to try this – for breakfast!!!! I haven’t been reading you blog for too long – but for a ninteen year old, you are doing a wonderfully amazing job! Your pictures + your recipes = amazing! Awe, thank you so much!! I am so happy you are liking my site and my photos! Thanks so much for continuing to read and comment, Shashi! 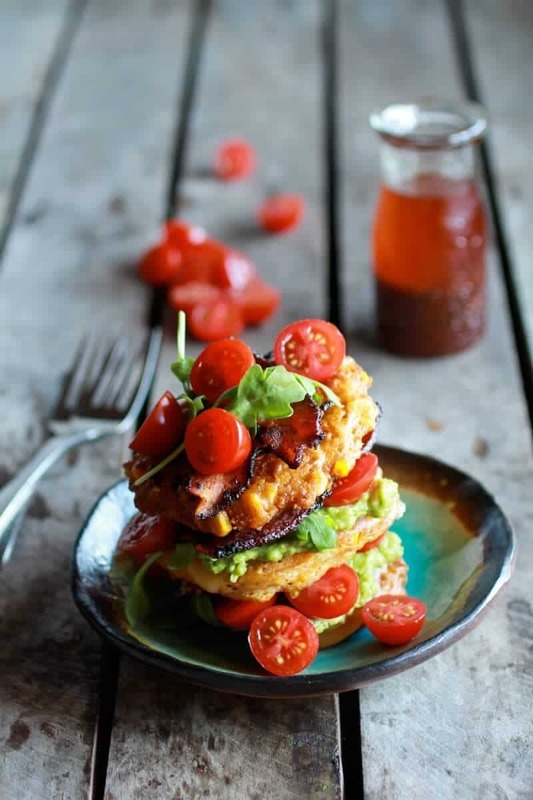 I love your grown up BLT, lady…it definitely knocks any BLT out of the park, all stacked up with those fritters! And bring on the bourbon sauce – I really must try this! Thank you, Julia! And yes, the bourbon sauce is so good! Can you come teach me to drive stick? It’s been on my bucket list, and I’d totally drive a stick shift car if I could! 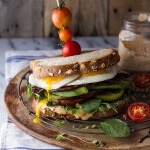 We can eat these yummy “grown up” BLTs after. OK? Ah… Yes, of course! Sounds like the perfect day to me! Bacon and corn are fantastic together! Agree! Thank you so much, Carrian! Haha! Thank you so much, Lindsay! Your bread you posted this morning looks incredible. I want a slice! Your photographs are absolutely STUNNING! And this looks so tasty. Thanks for sharing! Thank you so much, Kelly! That means so much coming from you! Oh my gosh this is fantastic. Bacon and gouda sounds like a match made in heaven! It is! Thank you so much, Faith! 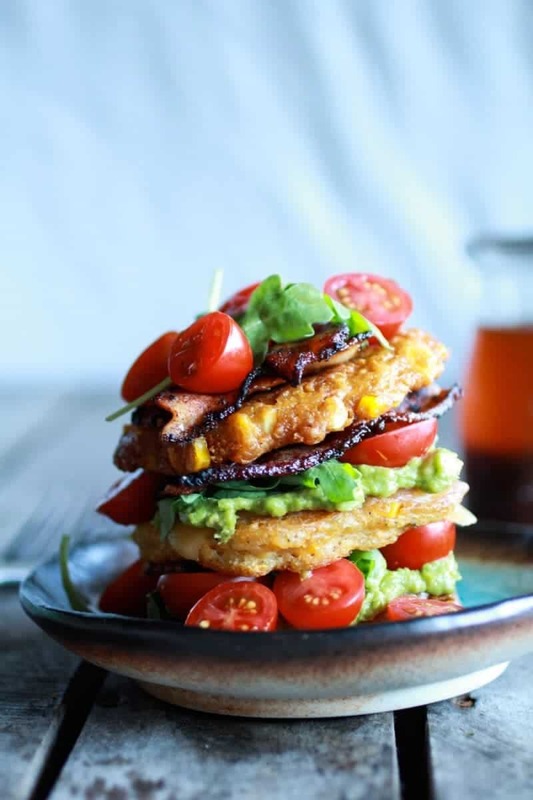 Wow, now that’s a stack of deliciousness! That Chipotle Bourbon Dressing sounds dangerously good. Thank you so much, Jeanette! The dressing is so good! This is absolutely stunning! You’ve nailed the combination of flavors and textures in this one. Thank you so much, Dara! I am a texture freak and these were the perfect combo! WOW. These are over the top. I love them. Tiegs, doing THIS and being this talented at 19 just blows my mind!! Seriously, I can not WAIT to see what you do in the next few years. I am rooting you on every day! You are the best, Megan! Thank you! You had me at bacon and corn! This dish is summer perfection! Love this so much! 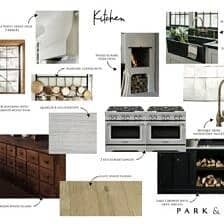 All the fresh flavors here are coming to my kitchen soon!! 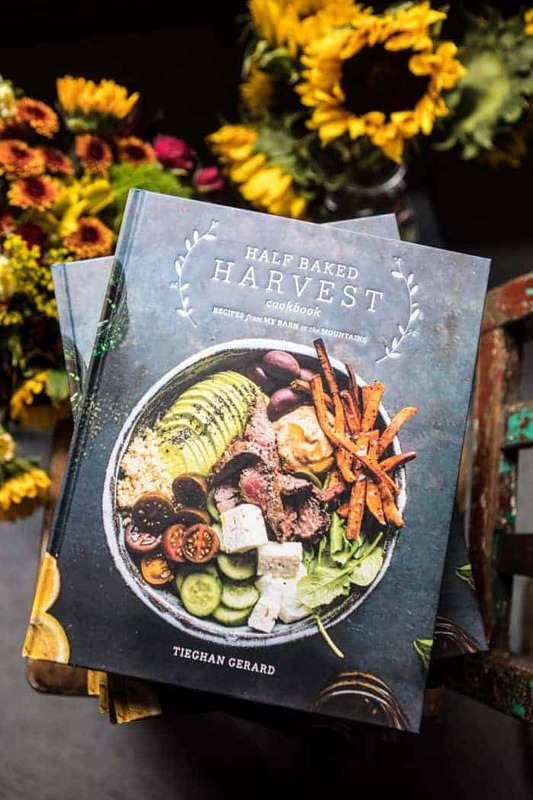 This looks SO DELICIOUS, Tieghan! I am really impressed with your pictures and your recipes – very talented!!! Thank you so much, Robyn! That means the world!! I wish I was HALF as talented as you are when I was nineteen. Fabulous job, this looks fantastic. Please, I have a feeling you were doing something just as awesome! I aspire to be as successful as you. You are such a role model to me! These look delicious! 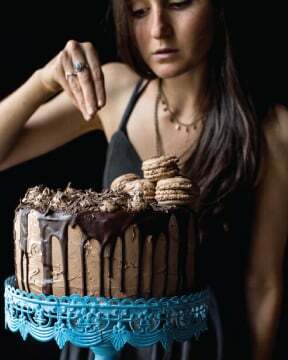 I also think adding avocado to cake batter sounds like a delicious idea. I am 25 and got asked if I was old enough to see a PG-13 movie a few months back, so I feel your pain. No way!! That is crazy and kind of funny. It would so happen! Thank you, Sally! The corn fritters are so good!! and once again your recipes blow my mind. I have been craving a BLT lately! 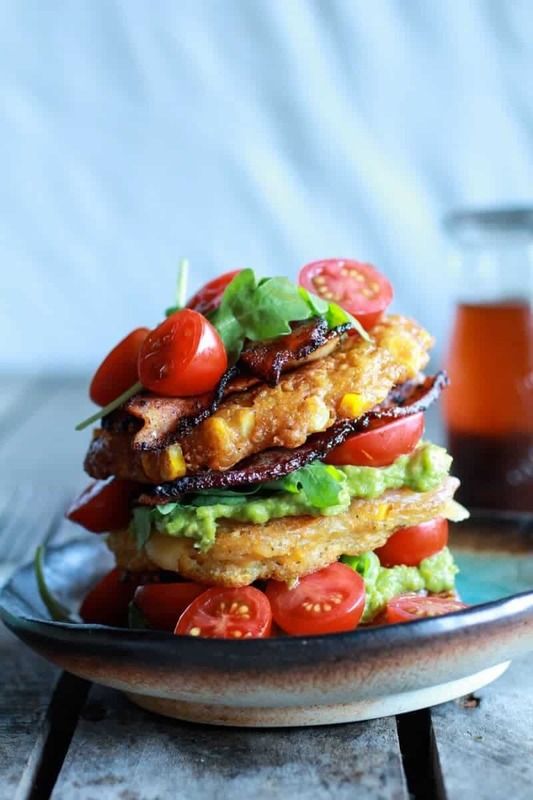 I love the corn fritter stacks! 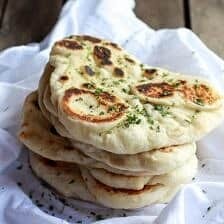 This BASOLUTLY one of your best recipes. My Godness, those pictures make me want to bite the screen. The bacon looks too tasty! Good grief, Tieghan! Why aren’t you working in some fancy pants restaurant or something? You’ve got SUCH talent! Love these fritters. Such a Southern classic, made 100x better with your creativity. I am good with blogging for now. Plus, not sure I would be cut out for the restaurants! Looks fantastic! 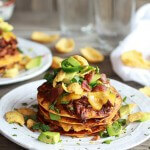 Love the layers of flavor; my family would absolutely adore this…can’t wait to try it! Thanks so much and for pinning too! I need this in my life!! 🙂 Well done lady! Nineteen or ninety, you are incredibly talented. Love the originality of this post – not to mention the photography!! BTW, the fritters look frickin’ incredible, to boot! – Great post!! Thank you, Dan!! You are awesome! I SO agree! Thanks for the link! 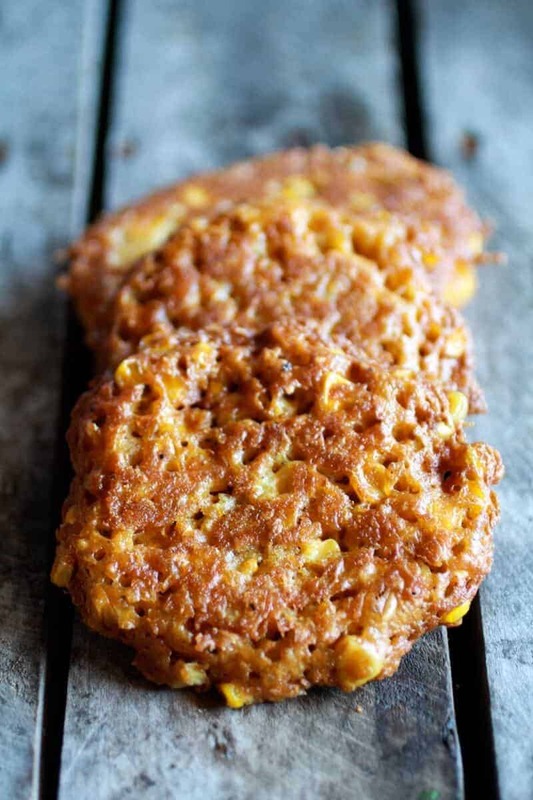 What a fun alternative to regular corn fritters! Awe, thank you so much!! You are so nice, Nessa! I’m so excited to try these that I’m making them right now. But, I’m panicking…for the corn fritters you don’t include baking powder in the recipe but the instructions say to add it. How much? Hope to hear from you soon cause dinner is waiting and I’m drooling all over the place! Oh no! I am so sorry! I am sure I am too late, but it is 1/2 teaspoon baking powder. I will go and fix the recipe now. Hope you still loved these!! And sorry again!! Yea! I guessed and that’s exactly what I added! Holy Cow!!! So delicious! 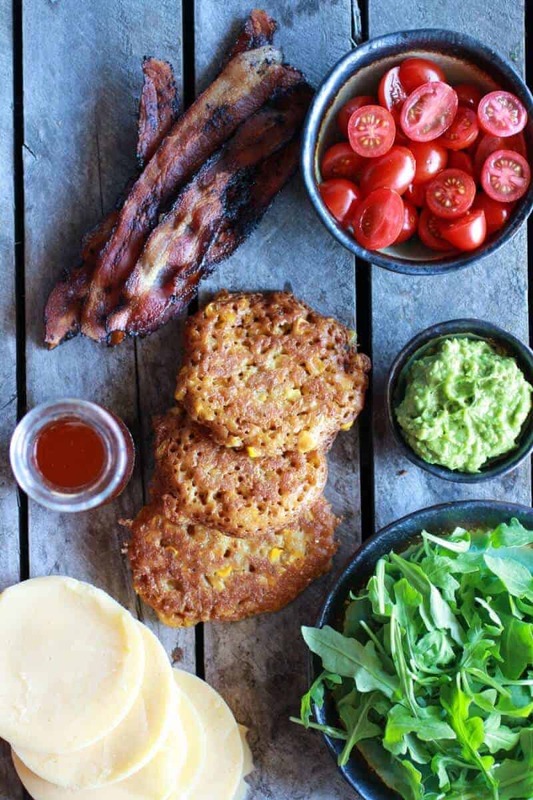 The bacon with the brown sugar and cayenne, the corn fritters, the avocado, tomato, arugla and dressing…SO GOOD! Definitely a party going on inside my mouth! I have LOVED every recipe of yours I have tried! You are an incredibly talented young woman! Thanks so much for sharing! YAY!!! So happy you loved these!! That make me thrilled!! Thanks so much for reading and trying my recipes, Jenae! your photos are all so lovely! 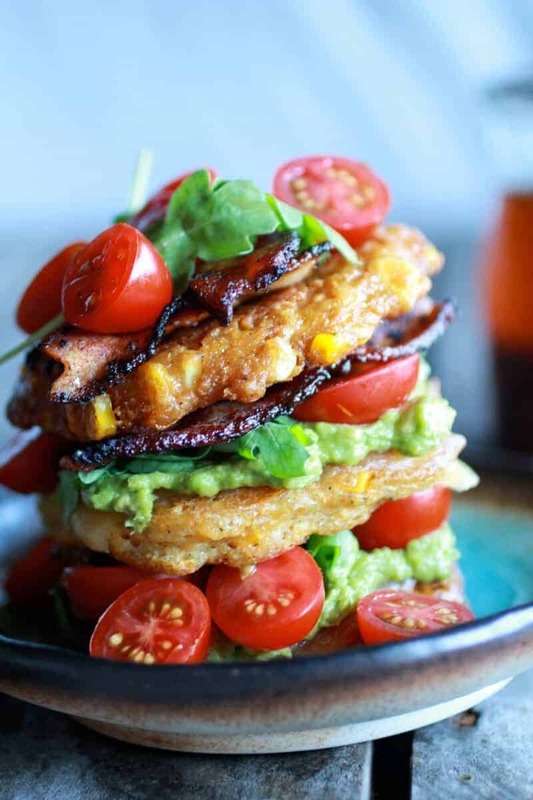 and what a perfect tower of deliciousness you’ve created… yum! This looks fantastic!! Your pictures are gorgeous as well! I’m currently living in Korea and (very sadly) don’t have access to some of these ingredients, but I am bookmarking this for my return to the States! Thank you, Tera!! Korea sounds amazing, you are so lucky! 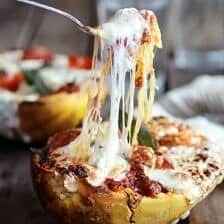 I made a version of these tonight for dinner and they were a hit! I was a little skeptical of the dressing when I tasted it by itself but it takes the dish from “different spin on the BLT” to “OMG THIS IS AMAZING”. We had plenty of leftovers because two fritters was enough for each of us…can’t wait to dig into them tomorrow. Yeah!! I am thrilled you guys loved these!! Thanks for making them! 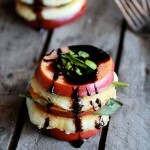 This looks awesome, going to make this toinght for dinner! Quick question: I am clueless about cooking with corn, do I need to cook (boil) it beforehand (I have some corn on the cob at home)? I am sure I am too late, but No pre cooking is required. Hope you loved these! I replaced the bacon for some breasola and it turned out great, thank you for the recipe! YUM! That sounds awesome! So glad you liked these! Thanks for giving them a try, Nina! I made this tonight for dinner and my hubby and I loved it! Next time I will cut the sweetness by eliminating the brown sugar. Delicious! Thank you so much for the recipe. Ya!! I am so happy you guys loved this! Thanks for giving it a try! Now this is my kind of BLT. Looks incredible! 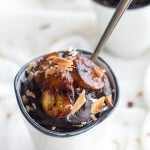 I made these last night – they were so good I almost cried when they were gone! Thanks for sharing. Of course!! I am so, so, so happy you love this! It is one of my favorites! This is a super-sophisticated and grown-up BLT. It looks absolutely amazing! I wish I could whip one up right now!! GREAT recipe. I’ve made it a few times when we’ve had people over, to rave reviews. I use pepper bacon, which kicks up the spice a bit. One note — you list 1/8 cup sugar as an ingredient for the fritters, but don’t say in the directions when it goes in. I’ve been adding it with the rest of the dry ingredients and it seems to work just fine! Thanks! So happy you are loving these!! Thanks for letting me know about the sugar. I will go fix the recipe now! So happy you loved it, Thanks! So happy you enjoyed it, THANKS! Lovely avocado and gouda :). Pictures looks so amazing. I am loving it. ! I seldom drop responses, however i did a few searching and wound up here Half Baked Harvest – Made with Love.